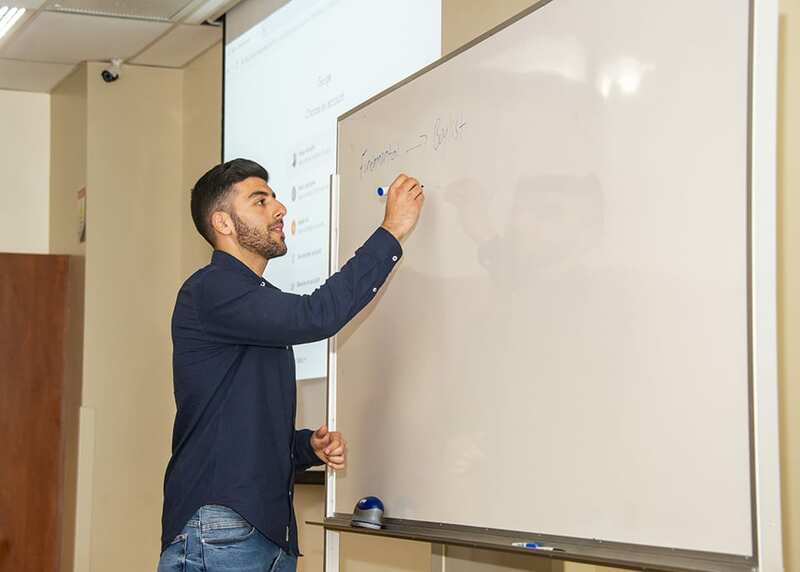 Senior economics major Idean Aminian demonstrating a concept to students in the Student Portfolio Seminar. Students taking the seminar regularly beat finance professionals in managing the university’s portfolios. | Photo: David Hawkins. From fall 2015, to present, the dividend portfolio has grown from $2,151,315 to $3,297,801, an annualized return of about 14 percent compared to the benchmark return of about 11 percent per year. The “return per unit volatility,” a common measure to see whether investments are gaining return by making investments that are too risky, is about 1.34 for the student portfolio compared to 0.83 for the benchmark. CSUN earned almost $323,000 more on the student-managed portfolio invested in relatively safer assets than the portfolio would have received with the average market return. When the first investment class met in 1993, the students were allocated $500,000 by The University Corporation, a CSUN auxiliary, to invest with the goal of providing a real-world context for what the students were learning in class. Despite the economic downturn at the time, the students’ investment portfolio beat Standard & Poor’s 500, a financial index, and earned a small profit for the university. Over the years, the single class has grown into a two-class seminar, and the amount of money the students handle also has grown. They now manage about $5 million, with about $3.5 million from The University Corporation, and the rest from the CSUN Foundation, the nonprofit fundraising arm of the university. Their investments, and the two classes are divided between two portfolios, stocks and exchange-traded funds (ETFs). In 2015, one of the computer labs in CSUN’s David Nazarian College of Business and Economics was turned into an investment laboratory and classroom, in essence, a “trading room,” with the support of donors. Computer stations were equipped with software and databases found at major investment firms. Students have the ability to project or share what they see on their screens with their colleagues, encouraging serious and thoughtful discussions about where to invest CSUN’s money.